A young woman finds herself transported to a labyrinthine world ruled by devotees to a despot who worships a mysterious deity. Alternately believed to be an angel, devil, or banished pagan deity searching for a new home, a goddess worshipped as Mother Darken created a sunless labyrinth of endless rooms as a safe place for fellow lost souls. The world of Darken is now divided into two factions. Priestess Clarity leads devoted followers who believe Mother Darken will return to provide for them once again while exiles are banished to scavenge Darken on their own. Clarity’s loyal arbiter Martin helps reveal a traitor in their group named Karisse. Karisse expresses her worry that Mother Darken has forsaken them since their world appears to be dying. Clarity stabs Karisse in her stomach for losing faith. Using a key entrusted to her by Mother Darken, Clarity opens a portal and pushes Karisse through it. Karisse ends up on Earth, where she is found by young nurse Eve. As she lies dying, Karisse exclaims that she knew there was a world beyond Darken. Karisse tells Eve to find a man named Taro to tell him they can return from Darken. Karisse then begins reciting an incantation. Confused, Eve opens the hospital doors behind Karisse to go for help and ends up transported to Darken. Eve explores the dark rooms linking Darken together. A little boy named Robbie attacks Eve and steals her cellphone. Eve also meets an exile named Kali and Kali’s mute companion Mercy. Eve, Kali, and Mercy are captured by Martin and two disciples, who are soldiers trained by Clarity to kill those who oppose her. Martin is astonished to discover Eve comes from outside. The three women fight back against their captors. Eve shoots one of the disciples with Kali’s gun. Martin becomes badly burned by acid kicked back at him after trying to pour it on Mercy. Martin and the remaining disciple retreat to Clarity while Eve, Kali, and Mercy escape deeper into Darken. Eve learns more about the world from Kali and Mercy. The women eventually come across a partial map of Darken. Despite Kali’s warning that it isn’t safe, Eve suggests hiding in an area identified as Haven. Clarity helps treat Martin’s acid burns by having him drink Mother’s blood, a black healing substance said to be the blood of Mother Darken herself. Clarity commands Martin to bring the outsider to her before the exiles can poison her mind. Clarity further instructs Martin to destroy Haven. Martin hesitates by pointing out that Haven is a sacred refuge where Mother Darken decreed no violence should occur. Clarity insists that Mother Darken wants them to eradicate the exiles. Martin murders the Head Keeper, who is Haven’s chief priest. During a battle with the disciples, Mercy is stabbed. Another disciple dies. Kali and Eve escape with Mercy. Despite drinking Mother’s blood, Mercy dies from her wound. Martin reports to Clarity that Haven is no longer safe for the exiles. However, Clarity learns Martin lied about destroying Haven when a captured woman reveals Eve is seeking safety there. Martin openly worries that Darken loyalists may no longer feel like they have a safe refuge. Clarity laments that her followers fear her, adding that she only wishes to be loved like they love Mother Darken. Kali tells Eve that she and Mercy weren’t exiles. Rather, they dared to speak out against Clarity, prompting Clarity to have her disciples take Mercy’s voice. Kali and Eve meet up with cowardly exile Ralston. A defecting disciple also comes to find the women and reveals he is Karisse’s former lover Taro. Ralston is suspicious of Taro, but Taro insists he only wants to help everyone escape by using Clarity’s portal key. Eve recounts Karisse’s poem. Taro explains it is an incantation that Mother Darken used to bring everyone to Darken. Eve, Kali, Ralston, and Taro barricade themselves inside a Haven prayer temple as Martin, Clarity, and the remaining disciples threaten to infiltrate. Ralston takes everyone through a secret passage leading to a jail. Taro mentions that Clarity doesn’t want anyone to remember what life was like before Darken because then she will lose control. Martin and the disciples capture Taro and Kali. Ralston separately captures Eve, revealing that he felt betrayed when Kali and Mercy once abandoned him in Haven. Ralston goes on to explain his plan to bring Eve to Clarity in hopes of replacing Martin as arbiter. Eve fights back and escapes from Ralston. Eve spies a man named Wren capturing Robbie and taking him back to a hidden lab. Wren puts the boy into a tank connected to a series of tubes. Eve confronts him. Wren shows Eve a badly burned woman, who is connected to more tubes, unconscious on a table. Wren explains that the woman is Mother Darken, and he is using the boy to replenish her so that he can extract what little remains of her life-giving Mother’s blood. After philosophizing about who she is, Wren reveals that Mother Darken used to walk among the people, but returned from using the portal one day in her current condition. Clarity brought her back. Wren agreed to not tell anyone about Mother Darken’s state and to commit himself to keeping her alive. Eve recognizes that Mother Darken’s burns are from acid, not from fire. Mother Darken suddenly grabs Eve’s arm, which then glows brightly. Eve realizes that Clarity attempted to murder Mother Darken. The limited light and power in Darken flickers. Wren explains that he will keep Mother Darken alive as long as possible, but once she dies, he has no idea where the doors will lead. Eve interrupts as Martin tortures Taro and Clarity threatens to pour acid on Kali. Eve reveals that Clarity tried to replace Mother Darken by killing her, but did not realize that Mother Darken’s death would mean the destruction of Darken too. Eve warns that everyone must leave Darken or they will die. Eve fights Clarity, who continues to claim that her followers love her. Clarity stabs Eve. Everyone is stunned to see Eve bleeding Mother’s blood. His trust in her shattered, Martin forces Clarity to stab herself. Clarity falls to the floor. Mother Darken dies, killing all power to Darken. Eve uses Clarity’s key to open the portal. Eve, Taro, and Kali go through it with several other citizens. Martin chooses to stay behind in Darken to bring more people to safety. Scanning the new horizon, Eve exclaims that Darken is just one place among many. She and the others find themselves in a strange Earth-like world that they agree to explore together. Mother’s blood seeps back through the portal into Darken. The black blood mixes with Clarity’s blood on the floor and brings her back to life. Clarity arms herself with weapons and steps through the portal. The people of Darken have lived in their maze-like realm of endlessly connected rooms for so long, they no longer remember what the outside world was like. Some doubt there even is one anymore. Lost souls sought sanctuary under the protection of their goddess Mother Darken, who built this dimly-lit haven and healed their wounds with her life-giving black blood. Then Mother Darken disappeared and their refuge started dying. Priestess Clarity presides in her place, assuring those who remain loyal that Mother has not abandoned them. Anyone who loses faith can join the exiles, scavenging dirty corners of Darken that resemble an indoor Mad Max wasteland. Or worse, Clarity will banish traitors through an interdimensional doorway with a promise that whatever waits on the other side poses a greater danger than anything inside Darken. The latter fate befalls Karisse, who gets a knife in her stomach and a push into the portal when Clarity’s lickspittle Martin outs her as a nonbeliever. Although she lies dying, Karisse finds her longtime suspicions validated when she ends up on Earth. Karisse implores young nurse Eve to find a man named Taro and tell him they can leave Darken after all. Eve’s confusion has little time to comprehend the odd request when Karisse utters an incantation as Eve opens the hospital doors behind her. Inexplicably, Eve is transported to Darken. Having an outsider in their midst inspires frenzied activity throughout Darken. While Eve struggles to find a way out of the apparent labyrinth, Clarity rallies disciples to eradicate the exile rebellion once and for all. Whatever mysteries hold Darken together, Eve is now at their epicenter, where unraveling the truth will forever change what everyone believes. Assuming you read the wordy summary above before seeing the movie, you’re now a long length ahead of anyone who goes into “Darken” blind. Most of the movie’s mythology comes in piecemeal crumbs, and nonlinearly to boot. The film isn’t particularly confusing per se, though there is a fair deal of fiction to straighten out while following along, which could be a bar to entry for people who don’t pay attention from the top. Get past this gate, stay onboard, and “Darken’s” rich atmosphere capably takes the fantasy from there. For brevity’s sake, I normally limit compliments to production design (Ciara Vernon) and cinematography (James Griffith, who surprisingly has no other IMDb credits). Since I don’t know who did what, I’d be remiss if art director Mackenzie Hartridge and set decorator Stefan Harhay weren’t given kudos too. Being a low-budget production, you may never fully fool yourself into thinking Darken exists anywhere other than a soundstage. Yet these leads and their teams put in a workhorse effort to mask the choking confines of whatever warehouse they were working in as well as can be expected. Only an unappreciative jerk would prevent his/her imagination from meeting them halfway by filling in remaining blanks. I don’t know what it is about Canadian indie sci-fi. Maybe the perceived commonality is all in my mind. But I always liken its look to Toronto/Vancouver TV shows I watched in the 1990s like “The Outer Limits” revival or “Psi-Factor: Chronicles of the Paranormal.” That’s a compliment if you have the same affinity for that style as I do. “Darken” exudes a Saturday syndication feel, though it suits the smallish scale to a T.
Something else that sold me on seeing the movie was the inclusion of Ari Millen from “Orphan Black,” another series I adore. It saddens me to say, Millen is shockingly the weakest link in the cast. Although he calms down considerably as the film goes on, Millen seems somewhat contemptuous about having to play an archetypical toady. Perhaps trying to purposefully chew scenery and having his attempt read as flippancy, Millen plays his religious zealot persona with the same brand of overblown caricature strokes that made Jake Gyllenhaal seem out of synch with everyone else in “Okja" (review here). Millen’s performance evens out in the end, but it is definitely the most bizarrely disappointing work I’ve seen from him. Much like Millen’s character, “Darken” can come together clunkily. There are a lot of people with a lot going on for an 80-minute endeavor. 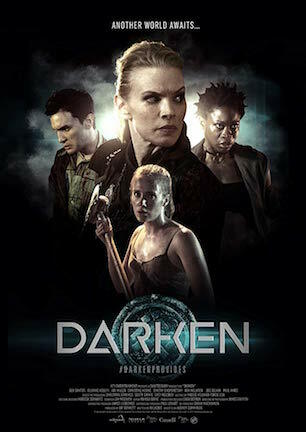 An episodic structure to the scenes suggests “Darken” may even have been conceived as a serial at some point (EDIT: “Darken” apparently intends to launch a digital series). Fitting everything into the frame of a feature film necessitates some clipping, cramming, and shortcutting that doesn’t always go smoothly. As long as you accept the presentation at face value, “Darken’s” ambitious ideas retain their entertainment weight. It’s a toss up if you’ll want a return ticket to this weird world. But one time through its portal is worth the trip, provided you come at “Darken” with the positive perspective of expecting the indie sci-fi style mentioned earlier. In that case, earnestness on both sides of the lens ensures you’ll remain engaged in the movie’s intriguingly kooky dark fantasy. November 27, 2017 by Ian Sedensky.